Free 2-3 Day Shipping on all orders. If you are an adoptive parent, YOU need this book. You will be unimaginably grateful for it because it will seriously help you survive the ups and downs of daily living with a child from difficult beginnings. Ce Eshelman, LMFT is an Attachment Specialist and adoptive mother of two children from difficult beginnings. The Attach Place was founded to support adoptive parents in person, and her blog has hundreds of followers from all across the U.S. and Europe. Blog readers pled with Ce to put her blog posts in a book. 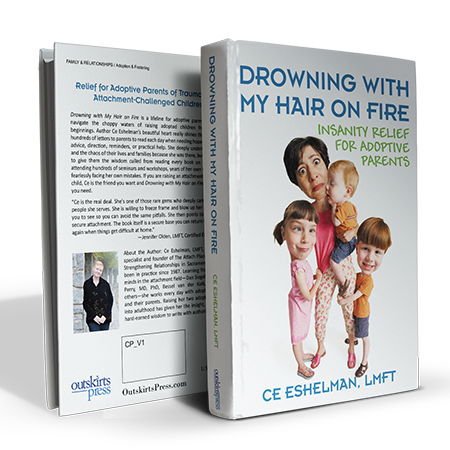 Drowning with My Hair on Fire is the book of the year for adoptive parents. Ce Eshelman’s daily blog is a therapeutic beacon to guide anyone who feels lost in their efforts to understand, support, and teach attachment-challenged, special needs, and easily dysregulated children. Ce brings an empathic and hopeful voice to those caring for kids who have been impacted by trauma and the significant barriers stress has presented to their healthy brain development. As a professional and a parent, I have benefitted immeasurably from her wisdom. Foster and adoptive parents often face very daunting challenges not experienced by people raising their biological children; how much more so for those raising children with attachment challenges. Full of the painful honesty of raw truth and lessons learned the hard way—as well as grateful humor—Eshelman’s Drowning with My Hair on Fire is an anchor of solid support for these parents and a helpful reference for helping others to understand this rocky path. It is a generous and loving book. As Ce always reminds us, Love Matters. Ce Eshelman, LMFT, attachment specialist and founder of The Attach Place Center for Strengthening Relationships in Sacramento, CA, has been in practice since 1987. Learning from the best minds in the attachment field—Dan Siegel, MD, Bruce Perry, MD, PhD, Bessel van der Kolk, PhD, and others—she works every day with adopted children and their parents. Raising her two adopted children into adulthood has given her the insight, humor, and hard-earned wisdom to write with authority and love.